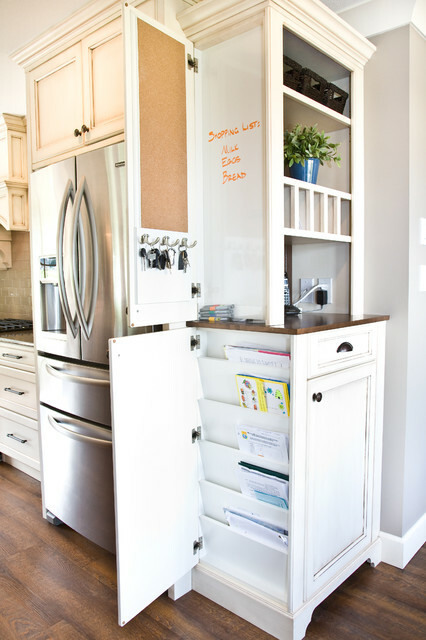 This cabinet was custom designed by us with the homeowner who has a very busy family life and needed to keep everything organized and in one place! We are very proud of our creative designers; as well as our talented shop team for making our ideas a reality! 5. Get your most important stuff togetherOnce work begins it can suddenly seem impossible to find anything. Get your stuff together now and put it all in one place well away from the work zone. If you won’t be using your regular entryway, set up a temporary command centre elsewhere with room for mobile phones, chargers, keys, mail and other essentials. Joanna Tovia added this to Storage Dilemma: Do You Hide Your Things ... or Show Them Off? LETTERS AND KEYSNeat and nifty. There would be no more losing the keys in this house, and the stacks of mail that arrive for different household members can be stashed and retrieved from the one place – goodbye benchtop mess. Kate Macdessi added this to Happy Birthday, Virgo! 13. Organisation stationsSpeaking of efficiency, consider a kitchen organisation station to keep the family in check. In the 10th most-saved kitchen photo of 2016, the highlight is the bonus end cabinet that incorporates clever space for keys, a pegboard and a notice board for family organising and to-do lists, as well as stowaway slats for magazines and cookbooks. reorientation of standalone cabinet next to basement door?? Kid's homework area / family organization station. Love that it doesn't take up much room.